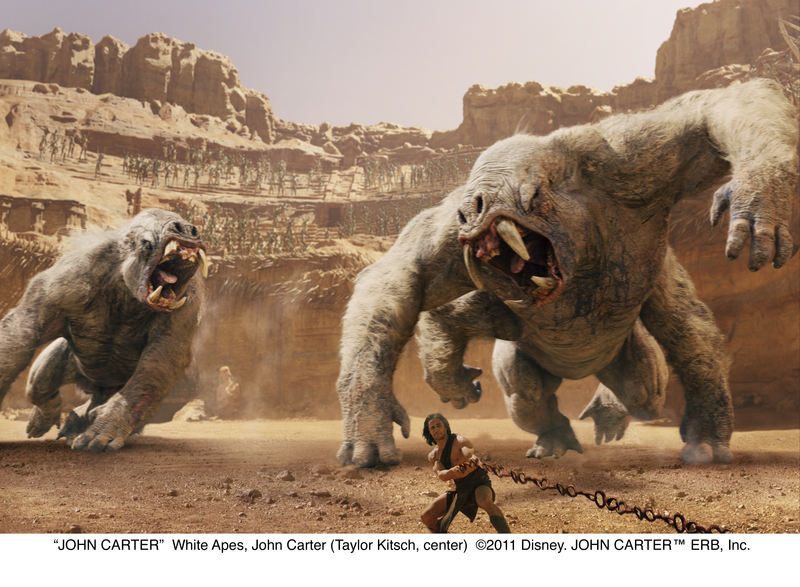 Since first writing about the film John Carter for Mostly Film nearly a year ago, I’ve done my best to avoid news of it. I’ve seen the trailers, but deliberately decided not to watch any clips – I wanted to come to the finished product as unspoilt as possible. That didn’t mean I escaped the news altogether, and some of that news wasn’t encouraging. The dropping of ‘of Mars’ from the title, reportedly decided after the massive failure of Mars Needs Moms caused an outbreak of brown trousers in the Disney marketing team, was a big worry. The name John Carter on its own didn’t seem to communicate much to a potential ticket buyer. If Lawrence of Arabia was being made today, would it be retitled just Lawrence, in case the mention of Arabia put people off? They might as well have called it A Film about Some Bloke and be done with it. The trailers themselves didn’t do much to reassure me. They seemed anxious to avoid any mention of the character’s history and pedigree, as if revealing that he’s from the 19th century would be a turn off – better instead to make the film look as generic as possible. (There’s a fan-edited trailer that does a much better job). A disappointing date with twins. Indications of marketing panic with big movies rarely bode well. That’s especially true of something like John Carter, which despite the century-old fan following, isn’t exactly well known in the way a property like Batman is. And when you consider that Burroughs’ work has been strip mined by pulp sci-fi merchants for decades – Avatar being the most recent example – the film could easily look like a rip-off of its own rip-offs. But my greatest fear was not that it would be a disaster, but that it would just be… ordinary. Not bad as such, just dragged down by too many compromises over the script, too many worries that audiences wouldn’t get it. So I was more than a little relieved when it became clear within minutes that my fears were unfounded. The film opens with a battle between bad guy Sab Than (Dominic West) and the forces of white hat city Helium, the outcome of which is decided by the intervention of bigger bad guy Matai Shang (Mark Strong). Scene-setting over, we move to Earth where former soldier Captain John Carter has made some unusual arrangements for his death. These include being interred in a tomb which can only be opened from inside, and leaving a journal containing his story to his nephew, Edgar Rice Burroughs. This was where I began to relax. It was obvious that the film intended to stay true to the atmosphere and detail of Burroughs. Stanton and his fellow screenwriters managed to remain faithful to the sometimes rambling narrative of the book, while making the necessary adjustments to create a more conventional plot arc (and set up for a sequel). So Carter now carries a hefty bit of emotional baggage to Mars that he has to deal with before committing to Dejah Thoris and the good guys – one that is effectively revealed in flashback scenes intercut with Carter taking on a Thark army. There’s also a proper bad guy around to provide a three-act structure, achieved by borrowing Matai Shang from the second Carter book, The Gods of Mars. Plot elements for that book are inserted throughout the film in a manner which rarely feels intrusive. Shang and his fellow Therns are where the film deviates most from the source material, but entirely successfully. It provides a credible reason (well, you know… credible in context) for Carter’s transportation to Mars. Ok, so… she’s a dog. Best of all, everything about the film looks and feels right; this is recognisably the Barsoom of the novels. The Martian technology, from the ships to the radium pistols, not only looks like it did in my head, but looks as though somebody has sat down and figured out how it should all work before building the props. The comedy alien dog sidekick is actually funny. The CGI Tharks are clearly built on real human performances (that’s quite a trick when playing characters with four arms while standing on stilts). In fact, few things in the cinema in recent times have made me as happy as our first sight of the baby tharks. Taylor Kitsch does look a bit overly pretty without his uniform, and the beard that goes with it, but has a gravelly edge to his drawl that suits the battle-weary Carter. I was slightly underwhelmed by Lynn Collins as Dejah Thoris; she looks great, but somehow failed to make much of an impression. Perhaps it’s that the concern to make her a modern, feisty, sword-swinging heroine rather than a damsel in permanent distress has overwhelmed the need to make her into a character of her own. Burroughs’ heroines were rarely drips (the likes of Dejah were always ready to slip a dagger between the ribs of any villain who got a bit rapey) but the movie Dejah is a not merely a princess, she’s also a ground-breaking scientist and badass warrior. Albeit one who agrees to an arranged marriage when the plot demands it. I might also have preferred our first sight of Barsoom to be Carter’s, but while the film’s two bits of early scene-setting prevent us from exploring the world in tandem with the hero, they do allow the exposition to be broken into manageable chunks. Even so, there’s a lot of background information to convey, which makes a fairly long (130-ish minute) film feel a bit too densely plotted. On several occasions, characters seem to traverse extensive distances in a matter of minutes, rather than hours or days. While those who know the books should be impressed by the economies made, I wonder whether newcomers will find enough space among the various warring factions to care about Carter and Dejah. Inevitably, it’s hard not to be reminded of other films. Star Wars and its sequels came to mind at a number of points (the single person fliers look a lot like the speeder bikes of Return of the Jedi), as did the 1930s version of Flash Gordon, Avatar (inevitably) and even Krull (but in a good way). Many of the new plot elements have a Stargate feel to them, but I’m sure Burroughs would have cheerfully lifted ideas from the Chariots of the Gods and the like had he been around long enough. This merely indicates the extent to which the novels have inspired other writers and directors through the decades, rather than any lack of imagination on the part of the filmmakers. But I do still wonder whether the general public will care. As I write, it’s still several days before the film is released. Most of the early reviews are reasonably positive, but maybe not sufficiently enthusiastic to tempt a sceptical public. If sequels are to be greenlit (and I’d really like that to happen), a lot of people will have to buy tickets. I’m confident that fans of the books will be delighted with the film, and relieved that the film has been made with evident respect and love for Burroughs. (They even make the altered title pay off, though I’m still not convinced the change was a good idea.) I’d like to think that those who don’t have my fond recollections of the novels will be able to enjoy the film for what it is – a very well made piece of pulp science fantasy – rather than dismiss it for being too redolent of films they’ve already seen. If not, maybe we’ll have to accept that John Carter turned up to his own party several decades too late.